The Breguet 690 Vultur design of 1948 was a mixed-powerplant design incorporating an Armstrong Siddeley Mamba turboprop in the nose and a Hispano-Suiza Nene turbojet in the rear fuselage. The jet provided additional thrust for combat performance and take-off. Experience with the Vultur, first flown on 3 August 1951, led the French navy to abandon the idea of such a powerplant for a strike aircraft. 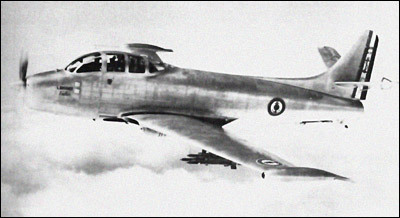 Instead, Breguet was contracted to develop a three-seat carrier-based anti-submarine aircraft from the Vultur. Engines: 1 x Armstrong Siddeley Mamba turboprop & 1 x Hispano Nene turbojet.